I want to introduce you to this wonderful organization. 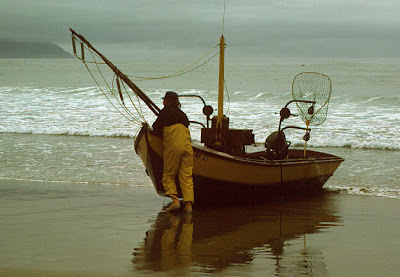 North Coast Land Conservancy (NCLC) has been working since 1986 as a land trust with citizens, agencies and municipalities to preserve some of the most precious and sensitive land along the north Oregon coast. NCLC has more than 25 fee title (owned by NCLC) conservation lands, totaling over 680 acres are preserved in perpetuity. They also hold conservation easements on more than 349 acres. We are very excited to have been in close communication with Neal Main who is the Conservation Director for NCLC, due to their interest in acquiring sensitive wetlands near Sandlake Country Inn. If the acquisition goes through, the land will be protected in perpetuity. In 2009 North Coast Land Conservancy closed on four conservation properties totaling more than 250 acres that will be protected forever. These areas ranged from a 1.5-acre tidal marsh along the Necanicum River in Seaside—one of the last remaining undisturbed marshes on the Necanicum—to an 80-acre Sitka spruce forest in Nehalem Bay. Seventy acres of estuarine wetland forest, 100 acres of coastal prairie, and more than a mile of beachfront dunes and forests were added to the network of conservation and natural resource lands this year. With all of our support, North Coast Land Conservancy can continue to protect some of the most sensitive areas of our wonderful and diverse coast. With your end-of-year gift, North Coast Land Conservancy will be poised to accomplish more in 2010 and will continue to take stewardship of these natural lands very seriously. Sun & Fun in December! Who says winter on the coast is stormy? I took this picture today at Haystack Rock in Pacific City. We've had chilly nights, but the days have been filled with sun and blue skies. Pack a jacket and come to the coast to explore our amazing coast without the crowds of summer. Whale migration has begun and it's the perfect weather to hike to the tip of Cape Lookout, Cape Meares or Cape Kiwanda to whale watch. All Oregon beaches are public and most allow you to drive on them. Don't even try it without a 4 wheel drive vehicle. Even with 4 wheel drive you can get yourself in trouble. Such was the scene this afternoon on the beach at Cape Kiwanda. Here's the sign inviting you to park/drive on the beach...notice there's no warning sign! Check out how deep those back tires are. Yup, they're stuck! Tide is coming in too. Sure hope someone is able to pull them out in time! DOH!!! Here at Sandlake Country Inn you can experience Oregon's Bounty in many ways. All you have to do is look out your window of your suite or take a walk. Don't be surprised if you see deer, beaver, a multitude of birds and amazing beauty. Take a walk on the nearby beaches and the bounty of beauty will astound you. As part of our commitment to being "green", we purchase local and regional foods and products when possible. For an example, our exceptionally comfortable Englander Eurotop beds are made in Oregon, we use our local Tillamook Cheese for all our cooking and we buy only Pacific Seafood smoked salmon for our Togetherness Baskets. That's just a fraction of what we do to not only promote green practices, but we feel it's very important to help promote our local economy and businesses. In our historic farmhouse which was built in 1894, the original homesteader was the very first cranberry grower in Oregon! His name was W.C. King and he became known as "The Cranberry King". His original property here was approximately 250 acres and so he had plenty of room to grow his cranberries. To harvest the berries, he would block the creeks (there are 2 on our property) which would flood the fields. The cranberries float to the top of the water and then are harvested. The areas around us now are mostly dairy farms, but there still are a few Ocean Spray cranberry growers left. This time of year fresh produce is a bit limited, but Oregon is fortunate to have fresh cranberries, apples and pears. When you stay with us, you will have an amazing 4 course breakfast delivered to your door each morning. The menu changes every morning, but you always will get some kind of fruit course. One of our guest's favorite this time of year is my Apple Cranberry Crisp. Sometime I will also add fresh pears with the apples. 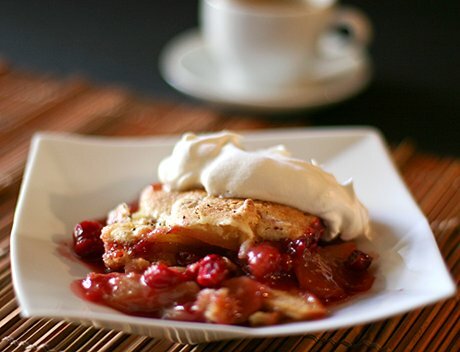 To help celebrate Oregon's Bounty, I thought I would share this favorite recipe with you! Better yet, come and stay at our Oregon Coast Bed and Breakfast and I'll make for you. No dishes to wash up! 1 p.m. during the winter and spring watch weeks. When looking for your Oregon Coast Lodging to view the whale migration, staying and the Sandlake Country Inn Bed and Breakfast is a great choice! We are located just minutes from amazing viewing locations. 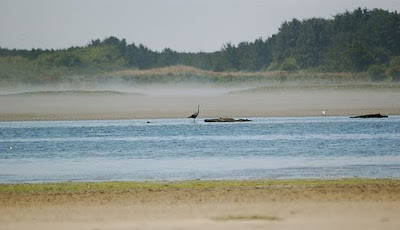 Enjoy whale watching, storm watching and the amazing Oregon Coast beaches nearby. When you're ready to return to your room, suite or cottage, you can warm up with a luxurious bubble bath, sit in front of your fireplace and relax with your loved one. In the morning, stay in your comfortable warm robe we provide for you and your hot beverages and a sumptuous 4 course hot breakfast with be delivered to your door! This post topic is the value of staying at a B&B. This is a touchy subject since everyone's opinion of "value" is different. Today, when staying in a hotel or resort, they seem to nickle and dime you to death. They have wi-fi, but most charge you for it. Staying at a downtown hotel? You can add at least $25 per night to park your car. If they are a "resort", you'll have to pay a resort fee whether you'll be using the spa, golf course etc, or not! A lot of hotels and motels are now offering "free breakfast". This usually consists of some bland looking and tasting bagels, pastries and really bad coffee. Room service? Sure, but you'll pay an arm and a leg for it. Business services...free fax and we'll print up your boarding pass. So, what do you think? Sounds like value to me! Your stay at a B&B is more of an experience, not just a place to rest your head. If you have never stayed at a B&B, try it! Each and every one is different and offers a different experience, so sometimes you need to try a few to discover the one(s) that fit your style. 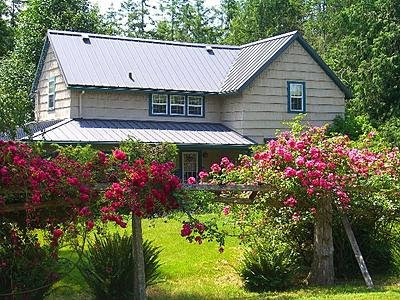 At Sandlake Country Inn, we specialize in romantic getaways on the Oregon Coast. Our rooms are large, private, comfortable and relaxing. Let us pamper you while you have your private breakfast in your own room. After you check in, the stress of your hectic life will disappear. To see our rooms and check availability, log on to our website at sandlakecountryinn.com We look forward to seeing you! This time I thought I'd talk a little about policies. Typically, a B&B has stricter cancellation, deposit and minimum stay policies. Why is this? Cancellations: Cancellations greatly affect a small lodging establishment. When you book a room at a B&B, you book a specific room. That room has been taken off their inventory and has been saved just for you. Many other people will have looked at the room availability for that B&B and saw your room was not available, so they went elsewhere. When you cancel even 1 week ahead of time, it's often not enough notice for the B&B to be able to re-rent it. If that room goes empty, the B&B loses a significant percentage of their income for that day or days. If you are considering booking at a B&B, do your best to make sure that you are sure you'll be able to keep your reservation. Each B&B will have set their own policies for cancellations, so make sure you are fully aware of them before you book. Deposits: Again, each B&B will set their own policy on whether they will charge a deposit before your arrival or whether you just need to provide them with a valid credit card. Minimum Stays: Many B&Bs will have some sort of minimum stay policy. If a B&B is very popular, you will most likely see a 2 night minimum on weekends. What's up with that you might wonder?! There's a couple of explanations for this. Most people looking for a single night stay are interested in staying over on a Saturday night. Sounds great, right? Full on a Sat. night! Well, now think about the Friday, the night before. When planning your little getaway, do you look for lodging on just a Friday? Hmmm, probably not. Ouch, now the income for that little B&B just went down by 50% for that weekend because they can't rent that single Friday night stay. That's why most popular B&Bs will have a 2 night minimum. Here's a hint. If you're looking for a Sat. night stay only, call the B&B a couple of days in advance to see if they are full and if not, they may give you that room for just 1 night. The bottom line is that hotels have a lot more inventory than a small lodging establishment, so their policies can be much more flexible and lenient. On the other hand, the experience and amenities you receive at a B&B in my opinion is so superior to a hotel, that it's definitely worth the adjustment of making your plans fit into the policies of the B&B. in the next blog post, I'll talk a little more about the value of staying at a B&B. Stay tuned! One of the great things about bed and breakfasts is that they are all different. One of the confusing things about bed and breakfasts is that they are all different! 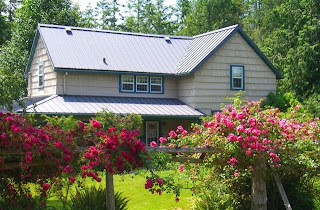 At Sandlake Country Inn a lot of our guests have never stayed at a B&B before and don't know quite what to expect. Well, first of all, you can relax. Literally! This is a place you come to leave the stress of jobs, kids, traffic and sleepless nights behind. The old image of a B&B with shared baths and the feeling that you'll be staying in "Aunt Jane's room" is not what you'll find in today's modern B&Bs. When you stay with us, don't be afraid to sit on the furniture and put your feet up! table with a bunch of strangers. We'll deliver your hot beverage of choice along with juice an hour before your breakfast. Don't worry, your hot beverage is in a caraffe and will be hot and steamy when you're ready for it. Enjoy lounging in your romantic room after a good night's sleep and opening your door to find our own home roasted coffee, tea or hot cocoa on a silver tray. Later, your hot 4 course sumptuous breakfast will be delivered to your door. Our breakfast elves knock to let you know it's arrived and when you open your door they will magically be gone! It's all about you and your loved one. No chatty chit chat to deal with. Enjoy your home cooked breakfast at your leisure. 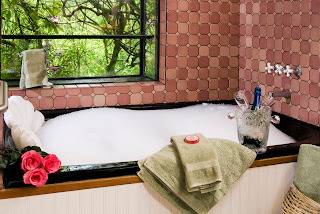 After breakfast, indulge yourself with a luxurious bubble bath in one of our amazing Jacuzzi tubs! Add some of our special fragrance bubble bath, but watch out! Only a couple of drops or you'll have more bubbles than you've ever experienced. Part Two: Staying at a Bed and Breakfast (part two) Why B&Bs need to follow a few different guidelines for reservations, deposits and cancellations. Are you an aspiring innkeeper at heart? Ever said "I'd love to have a B&B one day"? Come and join us for our Aspiring Innkeeper Workshop October 18-21 at the beautiful Eagle Rock Lodge near Eugene, Oregon. 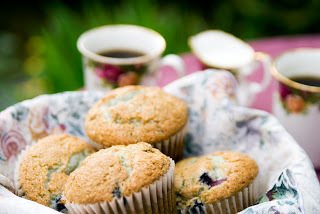 Being an innkeeper and having your own bed and breakfast is a wonderful, rewarding profession. Find out what life as an innkeeper is really like. Many people right now are in transition. The economy has forced many people to re-evaluate not only your jobs, but maybe even your life goals. Home based business are on the rise, and you can't get any more "home based" than a B&B! Having a B&B and being successful takes a lot of time and commitment. It's not just being a gracious host/hostess and meeting wonderful people. It's a business, and like any other business you need to have a business plan, financing, marketing, and the education to make it a success. 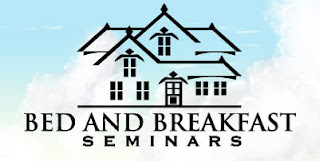 Once you have your B&B, now what? "Build it and they will come"...not anymore! Find out how to get "heads in beds". We emphasize learning about website design, marketing, PR, photography and how to create an internet presence. Mike Davis/The OregonianDrink in the visual beauty of the Three Capes area by finding a vantage point above Oceanside, at far left, or along the Cape Lookout trail south of Netarts, at left. It was the quintessential day at the beach on the Oregon coast. My 3-year-old son and I raced the waves while my wife wandered the beach with her camera. Our two friends tried their hands (and feet) at surfing. Dogs chased Frisbees. Kites soared briefly and then plunged earthward. Children built sand castles and then destroyed them with glee. But something was vaguely missing. The coastal vibe I grew up with in Oregon was somehow absent. I pondered a moment ... and then I realized: There wasn't a T-shirt shop in sight. My only-at-the-beach craving for saltwater taffy wasn't flaring up. I wasn't fighting the temptation to buy a cute creature crafted of tiny seashells for my knick-knack shelf back home. Was this heaven? Nope, Oceanside. Growing up middle-class near Portland, a trip to the beach pretty much meant Seaside. Go-karts and sticky-sweet treats and $3 souvenir shirts. The Pig'n Pancake. Three thousand people sharing our beach. Such are the things that make memories, and long-term impressions. But a few years ago I rode my bike the length of the Oregon coast, following the designated bike route. When the map took me off U.S. 101 at Tillamook, I discovered the Three Capes Scenic Drive. My relationship with the Oregon Coast was forever altered. And immeasurably improved. This area is not a secret, but it's enough off the path to make all the difference. Here you'll find all the things that make the coast a treasure and few of the things that make it tacky. There are, of course, three capes. And, really, only three towns. Oceanside (pop. 326) is the northernmost, and my favorite. There's little in the way of a retail strip beyond the justifiably renowned Roseanna's restaurant, a couple of small hotels and the Brewin' in the Wind coffee house. There's a small parking lot and a big beach. There's even a tunnel carved straight through a rock outcropping, connecting the main beach and another one to the north. Netarts (population 744) is an unassuming little town set on a lovely bay, a haven for clamming and crabbing. It also has a "treasures" shop that could be tacky, but any place named "Lex's Cool Stuff" recognizes irony, and therefore manages to stay on the funky side of that line. Pacific City (pop. 1,027) is the commercial center of the Three Capes route. You'll find a much larger collection of retail establishments, some time-share condos -- always a warning sign -- and even the occasional small traffic jam. But it somehow maintains the quaint air of authenticity required to remain charming. It also has some awesome food choices, among them the Riverhouse fine-dining restaurant, the Grateful Bread bakery and the Pelican Pub. But then, this peaceful stretch of rugged bliss isn't named for the towns. Let's talk about the capes. Cape Meares, at the northern end of the route, features a classic lighthouse, the undeniably fascinating Octopus Tree (a massive Sitka spruce with six trunks) and a coastal seabird nesting area. Just south of this cape a treasure-seeker can suss out the path down to Short Beach, a secluded inlet that until recently attracted only those nimble or foolhardy enough to skid down its steep dirt trail. But thanks to the efforts of a local volunteer, now there's an eccentric staircase down to the beach, making the trip safer, if less exciting. The beach itself sits beneath a large waterfall that, even though it spills over a manmade causeway, still lends a Blue Lagoon-style ambience to the scene. Cape Lookout, halfway down the route, juts a mile and a half out into the ocean, offering hiking trails through deep coastal forest that feels more remote than it is. A five-mile round-trip will get you to either the upper tip of the cape for stupendous and solitary views or down to the beach via a gradually sloping trail. Cape Kiwanda, standing sentinel over Pacific City, offers the utterly irresistible dune climb. I dare you to stand at the bottom of this sheer wall of sand, several hundred feet tall, and not go full-on conqueror. Those who make it are afforded majestic views, and the chance to roll, run or even glissade back down. But you can also scale the smaller hill next to the water and still get a nice look around. There are wonderful rocks and tide pools to explore on the south side of the cape, with easy beach access, and you might even get a chance to watch as one of the famous dory fleet gets launched from (or lands on) the sand. You'll find plenty of activity on the beach at Pacific City; between the adjacent brewpub, the car-accessible beach, the dune and the surfing, it can get mighty, um, well-used here. So, for a nice counterpoint, make sure to include a stop north of Oceanside at the site of Bayocean. Bayocean, built on a spit south of Tillamook Bay, was a developer's dream that turned into a nightmare. The vision of Thomas B. Potter, this planned community opened in 1912 and eventually had 4,000 lots and a town proper, including hotels, a school, advanced phone and water systems, and a massive indoor saltwater swimming pool. But storms and erosion gradually destroyed the town; by 1956 the few buildings that hadn't been swept into the sea were bulldozed. These days, it's fun to walk out on the spit and spend some imagination time with the ghosts. It's not that my childhood memories of going to the beach are bad. And I do have a youngster, so it's probably inevitable that someday soon I'll find myself dodging sunburned tourists with melting ice cream cones in their hands, on crowded sidewalks running in front of souvenir shops. Because somehow, some day, he will discover what I once experienced. 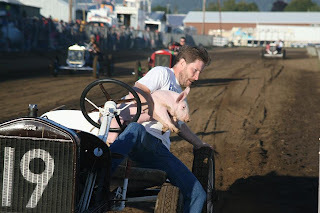 And once your kid's been to the Pig'n Pancake, how are you going to keep him down on the capes? But if your destination is still your choice, head for those capes. For a weekend or a week -- there's enough to do here to keep you busy that long -- the Three Capes Scenic Route delivers the best the Oregon Coast has to offer. It's my (adult) version of beach paradise. Getting there: From Portland, take U.S. 26 west and branch off onto Oregon 6 toward Tillamook. Arriving in Tillamook, turn south onto U.S. 101. Three blocks later, turn right onto Third Street/Netarts Highway. The Three Capes Route reconnects with 101 just south of Hebo. Where to eat: Roseanna's Cafe, Oceanside. Lunch/dinner. Seafood, pasta, sandwiches; dinner entrees $10-$25. Open 10 a.m-9 p.m. daily; no reservations. 503-842-7351. The Riverhouse, Pacific City. Lunch/dinner. 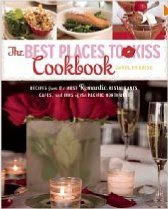 Traditional gourmet dishes plus seafood; dinner entrees $20-$30. Open 11 a.m.-9 p.m. daily; no reservations. 503-965-6722. Pelican Pub & Brewery, Pacific City. Breakfast/lunch/dinner. Pub fare plus pizza and seafood; dinner entrees $12-$20. Open 8 a.m.-10/11 p.m. daily. 503-965-7007. The Grateful Bread, Pacific City. Breakfast/lunch. Pastries, sandwiches, pizza; most dishes less than $10. Open 8 a.m.- 4 p.m. Thurs.-Mon., 503-965-7337. Pacific City Fireworks Celebrating 4th of July!! Join us for the Pacific City/Nestucca Valley Chamber's 4th of July fireworks. 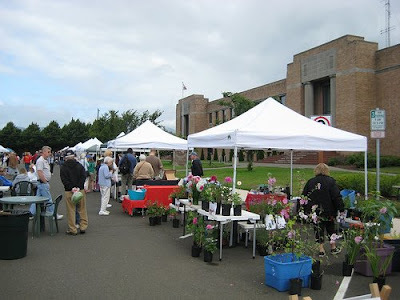 This year the celebration is actually on Saturday, July 6th, 2013. The fireworks starts at dusk at Bob Straub beach, but you can get a good view anywhere on the beach from Cape Kiwanda on south. Join us on the Oregon coast to celebrate our country's independence. 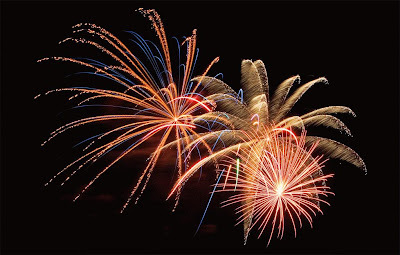 In addition to the professional fireworks show, there are many folks who bring elaborate fireworks to set off on the beach and over the ocean and can be as fun and entertaining as the professional show. You can make a fire on the beach, roast some marshmallows and enjoy the show. 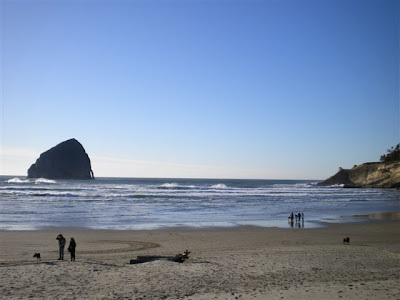 Sandlake Country Inn is located just a short drive (8 minutes) from Cape Kiwanda. We're in a perfect location to enjoy the local festivities, yet come back, take a warm bubble bath in a double jacuzzi tub and get out of the busy & noisy town of Pacific City after the fireworks. People tend to shoot off their personal stash of fireworks on the beach all night. It's been a long time since I was able to sit down and let you know what's been happening around here. If any of you have done any research on what the life of an innkeeper is really like, you know that it's very demanding of your time and energy. Add on to that, the responsibility of an aging parent and you can understand why I haven't posted here for a while. Many of our guests here at Sandlake Country Inn have shared with me their own personal stories when they were faced with the same stresses and I take comfort knowing that I'm not alone. Now, it's not all been stressful lately! Ron and I took our much needed relaxing vacation the beginning of May. After a long couple of flights to get to Miami, Fl, we stayed overnight then flew the next day to the Dominican Republic. We stayed at a wonderful all inclusive resort called Majestic Elegance. This time it was our turn to be pampered! In my next post, I'll post some photos so you can see how beautiful it was. Hmmm....now I have to find my camera and download all those pictures! We were there for 10 nights and did nothing but relax. I finally caught up on reading some books, taking a nap and enjoyed doing absolutely nothing. Now we're ready to give our full efforts to all of our wonderful guests and it's looking to be another very busy summer. I want to thank K.C. 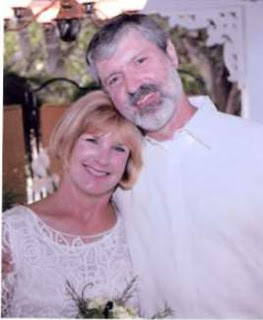 and her husband Kirk who were the innsitters that took care of the inn in our absence. They did a wonderful job and we have received nice comments from our guests on their behalf. 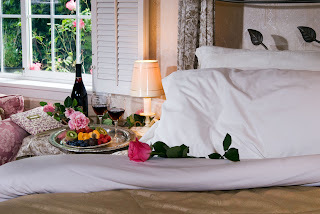 Believe me, it's not easy to just walk into someone else's B&B and run it seamlessly. Interactive Google Map Now On Sandlake Country Inn! 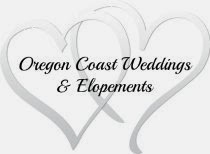 Are you someone who is not familiar with our area of the Oregon Coast or where our Oregon Coast Bed and Breakfast is located? Check out our brand new Interactive Google Map on our website. This new Google Map allows you to see not only where we are located, but where all our favorite hikes, outdoor activities, beaches, whale watching sites, restaurants and museums are. You can zoom in and out to view the different areas. Make sure you check out the satellite view!! You can see exactly what kind of area we are in, how close to the beach we are and what an amazing area this section of the coast is. Since this map is personalized just for us, we've added all of our favorite spots, shopping and restaurants. It doesn't mean that you'll find every single restaurant or store on our map and we've only concentrated on areas that can be reached by car within a short period of time. Once you are on our map and you want to see where all the restaurants are, just click the "on" button in the white "Dining" box. There are separate boxes for "Activities", Dining", "Shopping" and "Museums". The museums category also includes our local art galleries. We're very excited about this new technology and we've never seen it on another B&B website in Oregon! Let us know how you like it and if it's user friendly. Birding and Blues Festival - For three days discover secrets about the intriguing bird life and wildlife along our spectacular Oregon coast. There will be morning guided field trips and interactive daytime seminars. Then, each evening after an ocean sunset, try some fine restaurant fare, check out the art galleries, and warm your soul with blues in the night. Expect dancing and concerts both Friday and Saturday night plus music around town. The festival will occur the weekend of Friday, April 3, Saturday April 4 and Sunday, April 5th 2009 in Pacific City. April sits at the front door of the migratory season when birders ready themselves for the wildlife’s seasonal awakening. The weather is starting to include many spring-like days and the birds are become more lively.